OK, how have I got on with my new year's resolutions so far? Let's have a blow by blow update on all five of them. The results may be surprising. So far, so good. I have not bought any clothes all month. I have seen maybe one thing that I would have bought, had it not been for the resolution, but mostly I am avoiding temptation by trying not to look. The big success story, this, because it looks the hardest, but I haven't strayed once and am loving it. I will definitely aim to keep it up for another month now, and fully expect to do so for longer. There was one glitch in this one, as we all went out mid month to celebrate a colleague's promotion at the Bath Hotel. However, I have drunk only two pints of beer (Brother Rabbit, IIRC) this month. I have to report that I have not experienced any beneficial effects from this abstemiousness, other than in my wallet and my recycling bin. Better make this a month rather than year long one. I have read no detective novels in January, and have read quite a few Good Books, of which more later. But I miss those simple comforts, even though the more literary offerings can be rewarding. This is looking like the big fail. After a couple of weeks I found that it just wasn't grabbing me any more and I have stopped attempting it. Some days I would get no clues, others up to a dozen, but all that struggling just wasn't interesting enough. I think I'm not really much of a one for puzzles full stop, much the same as I don't care for Airfix kits. They just don't seem productive ways of expending effort. I found it boring. Sorry. As no one has remarked, my recipe the other day was unashamedly couched in pounds and ounces. This is not because I am a frothing Europhobe; no indeed. I am one of that fortunate, brief, generation to be bilingual in imperial and metric. The former was spoken at home, while I learnt the latter from my earliest days at school. I am therefore in the envious position of being to switch between systems and use whichever is best suited to the task in hand. For linear measurement, this is nearly always millimetres. Except, CRT, when talking about the lengths of boats (or for that matter the diameter of records). If something was built according to one system, little good, and much confusion, arises from attempting to express it in terms of the other. When calculating the weight of my water ballast, I find it much easier to work with litres and tonnes. In fact, I mentally convert gallons to litres and then equate tonnes with tons to get a rough approximation without too much brow furrowing. But where I refuse to accept that metric can ever be superior is in the weights and measures of recipes. Nothing can be simpler - especially for scaling up and down - than a sixteen-based system, based as it effectively is on halving and doubling. I only have to look at a metric recipe, with quantities ending in '5', to glaze over. When did we discover the need to be accurate to within 5 grammes (that's somewhere between a fifth and a sixth of an ounce) when making a victoria sponge? The only reason we get presented with these absurd figures is because the damn recipe has been converted from an imperial one in the first place. More than 300,000 of Britain's poorest people live at least 1km from a free-to-use cash machine, raising questions about whether the most disadvantaged can obtain cash without paying a fee, the government's adviser on poverty has said. Figures obtained by the Guardian from the Link network, the body responsible for running Britain's ATMs, show there are 269 low-income areas lacking a free machine within a 1km radius. These "cash machine deserts" mean people face a fee ranging from 75p to £10 to retrieve their money via an ATM. In contrast, in one eight minute section of my walk to work, I pass no fewer than eleven free-to-use cash machines. Eleven. When I arrived here last year, there were eight, all except one attached to banks, but since then a new Sainsbury's Local and a Tesco Express have opened, each complete with cash machine, and just in case there still weren't enough, the Post Office added one to their front window. Why? What's in it for them? Am I more likely to shop in Sainsbury's if I can get my cash from right outside the door rather than a few steps down the road? Does the Post Office have a policy of installing machines regardless of existing provision in the area? Come to think of it, what does it say about an area that it has five bank branches within a five minute walk, in what is no more than a small suburb? Perhaps the dreaded Wikipedia points towards the answer - apparently my lovely little part of town was 'identified in 2003 as the highest ranking area outside London for overall wealth'. I had no idea, honest. Bake at Mark 4/150 for about 20 minutes. When slightly cool, mark out into portions; don't try to remove from the tin until cold because it will fall apart. This is the first version of a new experimental flapjack recipe - suggestions for improvement welcome. It might be easier with marg. (in which case you'd want 4 oz by weight) but I'm still avoiding artificially hardened facts despite having foresworn butter, lard etc. After the last HNBC meeting and 'social' back in November, an ever increasing number of us repaired to the Folly at Napton for supper. Jim and I had a most enjoyable meal, seated at a table with Amy and James of Willow. My meal was haunted somewhat by the ostensibly delightful, but actually rather disturbing cruet. The bone shaped pepper pot was fine, but it did feel rather peculiar to invert the small terrier and see streams of salt pour from its blank eyes onto my chips. Apologies for neglecting to get an action shot, but it was every bit as weird as you might imagine. 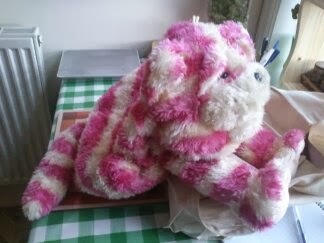 Bagpuss was rescued from the Save the Children shop (for £2!) 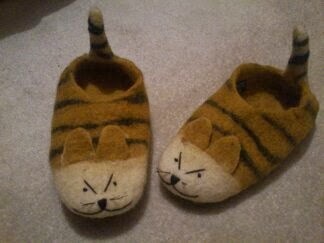 and successfully rehomed with my friend Dean, while the wonderfully grumpy felt slippers were from No. 2 Son. .... unless the Sheffield Corporation had its own foundry of course, which I wouldn't put past them, although I can't find any record. Hopefully the first of an occasional series as they catch my eye. Or what we are now apparently supposed to call a 'life hack'. Got a really tasty sounding veggieburger recipe, but can't face all that sticky shaping and messy frying (during which it all falls apart anyway)? Simply spread the mixture out and press down in an oiled baking tin, and bake in a hot oven for about twenty minutes, then cut into sections and remove with a fish slice. All the flavour and nutrition, with none of the hassle! Apologies for the rather dark photo. 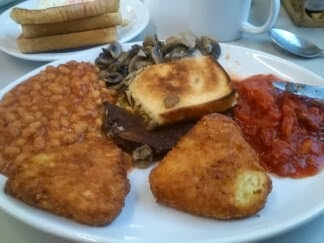 Vegetarian breakfast at the Truckers Rest, on the A5 near Cannock. Last night I watched some vintage Top of the Pops performances from 1979. It was, by and large, not a great year for popular music, but my goodness, how superior the trousers - and the wearing of them - was to today. Whether unbelievably tight drainpipes or flares, high waisted pleat-tronted or flat fronted suit trousers, every pair fitted its wearer to perfection. Ska, reggae, punk, soul; even the Nolan Sisters... not a single person was displaying any underwear, no waistband circled mid-buttock; no crotch hung at knee level and no hems trailed on the ground. Whereas today, whilst enjoying a late breakfast at the A5 truckstop, a young herbert got up from the table he was sharing with two young ladies displaying not merely the usual unsavoury underpants, but a good seventy percent of his bare bum. It's lucky I was having the vegetarian breakfast or it might have quite put me off. Apologies for not thinking of taking a photo before it got eaten. Vegan month began with our traditional New Year's dinner, a McSween's veggie haggis (they're fabulous, do try one if you can, even if you don't like/can't face real haggis) with mashed potatoes (with olive oil) and, in the absence of any swede in the Co-op, carrots. Put all of the first group of ingredients in a slow cooker and set to medium. Peel the onions and slice vertically into segments. Peel the garlic cloves and cut into 10mm chunks (very approx). Toss with olive oil on a baking tray and roast for 30 - 45 minutes at 200c/mark 7. When they're just starting to look a bit charred around the extremities, take them out of the oven. Crush some of the lumps of garlic, then add the lot, with its oil, to the pot. Stir, but leave some onion sticking out of the liquid. Leave to cook for about four hours or until you're ready. Just before serving, tear up the basil and stir it in. Tonight, in the spirit of using up the stuff that's still left, it's lentils with onion (red and white! ), garlic and ginger. Bland (No. 2 son has rclaimed his chilli flakes) but comforting enough for the weather. Well, having solved more than half of the Guardian cryptic crossword on Monday, I managed two and a half clues on Tuesday, and absolutely none yesterday. It's only lucky l started when I did, or I might have given up already. Never having paid the thing any attention before, I don't know whether the difficulty is randomly distributed, or if there's a deliberate escalation through the week. If so I dread to think what Saturday's is like - although they do at least offer a prize for that one, part of which is their 'Secrets of the Setters' book, which you would think would be splendidly redundant to anyone who had got that far. If I am going to start reading more proper and improving books, I can report on them again without shame. I arrived in Newhaven on December 20th with a good stock of charity shop books to keep me entertained over the festive period. In addition I received one very big one as a Christmas present. So here is what I have been reading. Dated and rather unamusing early novel, interesting really only as a period piece. I enjoyed her Dancing Backwards, but was never sure how seriously this one was meant to be taken. The plot stretched credulity a bit, but some of the emotion was quite good. The magnum opus which took her nearly a decade to wrote weighs in at 771 pages and was a Christmas present which kept me going for two and a half solid days. It's had rave reviews in the press, but I honestly thought it could have been twice as good at half the length. A heavy (in more ways than one) saga, laden with meaning but in which few of the characters shine. I had never heard of the author, or the Costa-award winning (and multiply nominated) book before I picked it up in Age UK, but this has to be one of my best books of 2013. The prose is almost poetic in its economy, but without poetry's pretensions. Everything is clear, but nothing is laboured. If The Goldfinch is a detailed Heironymous Bosch nightmare, What Was Lost is the purest sketch, conveying everything in a few perfect lines. Parts of it are laugh out loud funny (as where O'Flynn describes, without comment, a security guard making his tea with microwaved 7-Up and sterilised milk) but the whole is possibly the saddest book you will read in years, but it wears it so lightly you won't notice until you put it down, the terrible echoes of things unsaid. Another worthy book, and Booker shortlisted; another saga of unloveable and largely unengaging characters with no clearly defined ending or, indeed, waypoints, and largely unenlivened by beautiful prose. Its main redeeming feature was its detailed Sheffield - and even better, Broomhill - locations. Although I am sure (pace page 89) that if you were heading towards the Broomhill shops, the Hallam Towers would be on your right and the blind school on the left, rather than vice versa. And that's that for Christmas. I'll report on the next batch at the end of January.